In Fayetteville, Arkansas, for example, community volunteers and local officials have committed to provide habitat for wildlife on over 250 sites, including city parks, school yards, backyards, businesses and even wastewater treatment plants. The mayor attends the dedication of every Schoolyard Habitat® and educates school kids about the importance of conserving wildlife. As a result of these volunteer-driven efforts, the National Wildlife Federation has certified Fayetteville as a Community Wildlife Habitat. I mostly agree, except I think it would be naïve to believe that many of the people who are currently uninvolved with conservation issues will immediately leap into the political fray once global issues are reframed as local ones. A key lesson from the behavioral researchis that education on the issues, by itself, rarely stimulates action. Many people fail to take action on the environment despite being both knowledgeable and concerned. Behavioral change typically comes about after an individual completes small first steps and sees positive and concrete outcomes. As volunteer efforts proliferate, a key challenge for local leaders and their partners in conservation organizations will be to design projects that measurably improve the condition of imperiled wildlife species and habitats. One example of how this might be accomplished comes from the Chesapeake Bay watershed, near Washington, D.C. where I live. 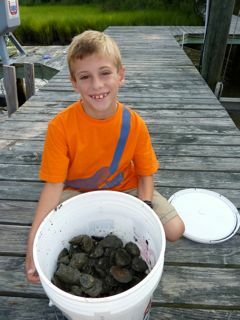 In the Oyster Gardening Program, volunteers in Maryland and Virginia sign up with the Chesapeake Bay Foundation(CBF) to grow oysters in rivers and streams in their communities. Volunteers place seed oysters into cages and install the cages at private docks, community piers and marinas. After a year and inch or two of growth, the volunteers return the oysters to CBF, which then plants them in a sanctuary (non-harvestable) reef. As the reef grows, CBF will be able to quantify the oysters’ role in filtering the bay and restoring it to health. Editor’s note: This essay was also published at the Nature of Cities blog.